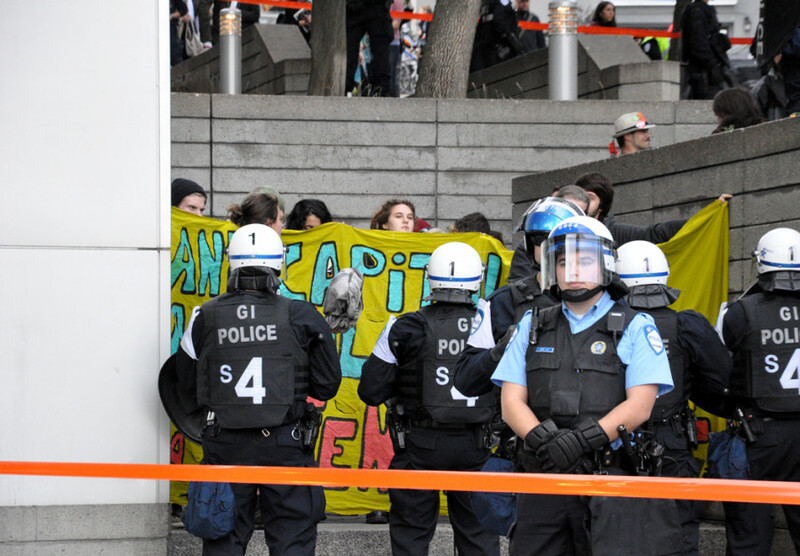 Police surround a group of protesters during a protest against Line 9. 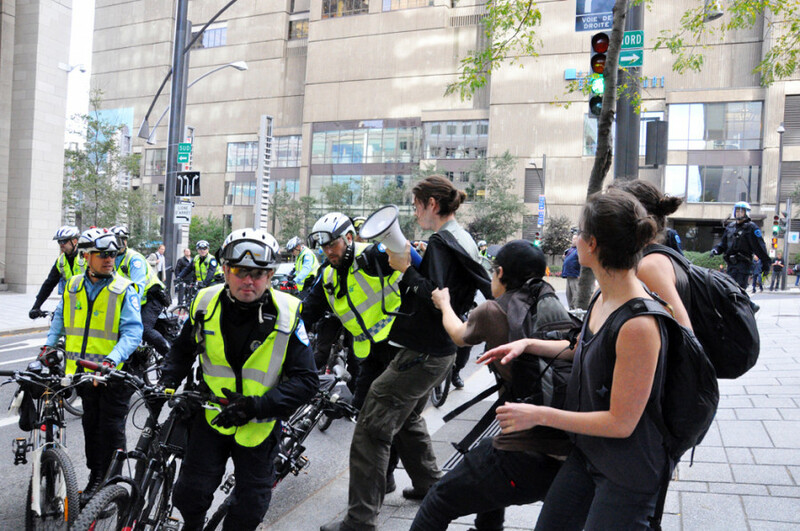 Police guard a kettle of detained protesters during the protest. The National Energy Board just wrapped up four days of hearings in Montreal on energy delivery company Enbridge’s proposal to increase the capacity of the Line 9 pipeline and reverse its flow to transport oil from Western Canada to Quebec refineries. If you happened to cross Victoria Square on Oct. 9, you may have seen the protest against the project—or maybe not. The demonstration was declared illegal and smothered by police in less than two hours. The hearings will resume in Toronto on Oct. 16. If you find all this confusing, you’re not alone. The issues are as murky as a gallon of heavy crude. To make some sense of it, here is a basic guide to the debate surrounding the controversial project. What is the National Energy Board and What Does It Do? The NEB is a quasi-judicial federal agency with headquarters in Calgary, established by the National Energy Board Act in 1959. Essentially, it oversees the construction, operation and regulation of oil and gas pipelines and international power lines. The NEB oversees 71,000 kilometres of pipeline and 1,400 kilometres of international power lines. It also sets tolls and tariffs for pipelines under its jurisdiction. The NEB doesn’t make energy policy—that’s a job for Parliament—but it enforces the rules. According to its official website, the core of the NEB’s mandate is to promote environmental safety and protection, as well as “efficient energy infrastructure and markets in the Canadian public interest” following the standards set by Parliament. For major project applications, the NEB issues a public hearing order and holds public consultations, such as those just held in Montreal and continuing in Toronto on the proposal by Enbridge Inc. Participants at the hearing include the company making the proposal (such as Enbridge), and other parties with expertise or that are directly affected by the project (the environmental coalition led by Équiterre, for example). The NEB also has a team of specialists to lead environmental assessments of a project, and keeps a record of oil companies’ emergency plans in case of a spill. Omnibus Bill C-38, which was given royal assent in June 2012, made significant changes to the NEB. These changes include limiting its review time for pipeline projects to 15 months, removing the requirement to assess potential damage to natural habitats and giving Cabinet the final deciding power over project approval. Enbridge is an energy delivery company based in Calgary. Originally incorporated as the Interprovincial Pipeline Company in 1949, Enbridge has grown into one of Canada’s largest corporations, transporting two millions barrels of oil per day. The company ranks 12th on The Globe and Mail’s list of Canadian businesses with the biggest revenue for 2013. What’s their Proposal, in a Nutshell? Enbridge filed an application in November 2012 to reverse the flow of Line 9B and increase its capacity. In service since 1976, the 639-kilometre pipeline runs from Sarnia, Ont., to Montreal East. The pipeline’s capacity would increase from 240,000 barrels per day to 300,000. The line flows east to west, but Enbridge is trying to reverse the line to carry oil from Western Canada, including Alberta’s oil sands, and the Bakken formation in the U.S. and Canada to Quebec’s two refineries, one in Montreal East and another in Lévis, Quebec. What Are Some Common Pro-Pipeline Arguments? In addition to Enbridge, the Conseil du patronat du Québec, the Association of Canadian Petrol Producers, the Fédération des chambres de commerce du Québec and the Manufacturiers et exportateurs du Québec support the project. They argue that the reversal will create a reliable energy source necessary for Quebec’s economic development. Douglas Crowther, a lawyer acting for Enbridge, said at the hearing on Wednesday that the pipeline could lead to refinery cost-savings of about $23 billion over 30 years. An Enbridge spokesperson, Ken Hall, told The Link that the project would also breathe life into Quebec’s faltering refinery industry. Depending on whom you ask, the risks involved are either huge or minor. Locally based environmental group Équiterre said the pipeline—which crosses the Ottawa River and other tributaries—endangers the water supply of 2.1 million inhabitants in the Montreal region. Équiterre also argue that the reversal would lead to an increase in dependence on tar sands oil and greenhouse gas emissions. The cities of Montreal, Toronto and Kingston also have safety concerns. An August 2013 report by the consultancy group Accufacts puts the pipeline at “high risk” of corrosion and rupture. At the Montreal hearings, Crowther said the Accufacts study was misleading. The project might also harm First Nations communities. The Mohawk Council of Kahnawake, which participated in the hearings at the Palais des congrès, opposed the proposal on the grounds that it might interfere with the exercise of Aboriginal rights on land near the pipeline. Chief Clinton Phillips said that the pipeline runs roughly three to 40 kilometres from all Mohawk reserves, stretching from Six Nations to Tyendinaga, Akwesasne, Kanesatake and Kahnawake. “Of particular importance to the Mohawks of Kahnawake are the fishing and spawning sites of the wildlife in the Bay of Quinte area, which is in very close proximity to the Enbridge Pipeline 9 right-of-way,” he said. What Would be the Consequences of a Spill? It’s impossible to say for certain what the consequences of a spill would be, but critics of the reversal point to an Enbridge spill that occurred in July 2010 as an example. A pipeline cracked in Marshall, Michigan, and thousands of litres of crude oil flowed into the surrounding wetlands and Kalamazoo River. Originally, it was thought that 843,000 gallons of oil had spilled, but this number was later revised to 1.15 million gallons. Hall told The Link the company is still cleaning up after the spill and has spent close to a billion dollars so far. In addition to new precautionary measures, Enbridge has hired spill teams as part of their emergency preparedness plans.